In 2011, a young man named Mohammad posted a video on YouTube where he spoke into the lens of a handheld camera. “My name is Mohammad, and I am undocumented,” he said. He explained how his parents immigrated to the United States when he was 3 years old, and detailed the difficulties of being undocumented, including being rejected from his dream university because he lacked a Social Security number. He described how his experiences inspired him to become active in the DREAM movement, a group of young activists working to support the DREAM Act and immigrant rights. Mohammad’s video, along with stories of other young people “coming out” online as undocumented, are highlighted in an upcoming book, “By Any Media Necessary.” Co-authors and media scholars Henry Jenkins, Sangita Shresthova, Liana Gamber-Thompson, Neta Kligler-Vilenchik, and Arely M. Zimmerman explore how young people like Mohammad use media to participate in the political sphere and speak out about issues that matter to them. Political participation is changing, and the authors present multiple examples of young people who aren’t adhering to old definitions. In the past, participation meant volunteering for a campaign, collecting signatures, joining a protest movement, or donating to a candidate. But young people today are harnessing digital and social media tools to get their stories out to the world. 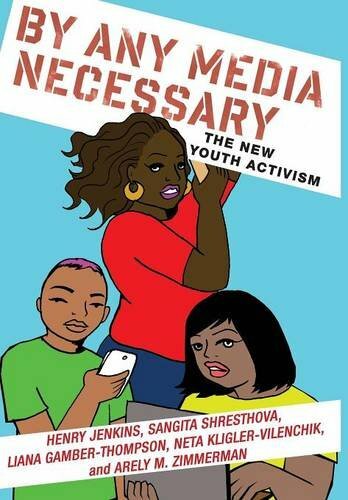 “By Any Media Necessary” will be published this summer. The book, according to co-author Gamber-Thompson, is a compilation of several years of writing and research that included talking with hundreds of young people across the country. The project was supported by the MacArthur Foundation and was carried out through the MacArthur Research Network on Youth and Participatory Politics. The authors have created free, online, easy-to-implement workshops and curriculums for educators across disciplines who want to understand how young people are reshaping civic activism. American Muslim youth, for example, are using storytelling and social media to explore identity and engage in discussions about Islamophobia in the U.S. Young libertarians, meanwhile, are using the internet to spread memes, communicate, meet up, and make music videos. Of course, the tricky part of writing a book about a rapidly evolving concept like participatory politics is that it’s always changing. The bulk of the book’s research wrapped up before the #BlackLivesMatter movement, to which many of the book’s core concepts can be applied. #BlackLivesMatter activists have used Twitter and other social media platforms to tell stories and mobilize protests in cities and campuses across the country around police brutality and discriminatory practices in the criminal justice system. Plus, we’re in an election season where participation on social media has a great impact on politics. Donald Trump engages a huge audience on Twitter, and Bernie Sanders supporters have turned a once-little-known candidate into a mainstream one largely via social media. Gamber-Thompson, who is also a Program Associate at the National Writing Project, also draws interesting parallels between the political acts cited in the book and supporters of anti-establishment candidates. Both Sanders and Trump, for example, are tapping into the nationwide sentiment that electoral politics isn’t responsive. This sentiment is similar to the one young people engaging in nontraditional political activities have echoed for years, Gamber-Thompson said. Not everyone is convinced of this shift in civic participation, though. Most notably, Malcolm Gladwell’s 2010 article in The New Yorker, “Slow Change: The Revolution Will Not Be Tweeted” argues (strongly) that activities like posting a video, tweeting about an event, or changing a profile picture to support a cause are a “low cost” form of activism. In other words, young people are phoning it in, taking the easy way out of real activism. But the authors of “By Any Media Necessary” say that young people using new communication tools to express views is anything but “low cost.” Young DREAMers make themselves vulnerable to threats and put themselves at risk for deportation when they “come out” in videos about being undocumented. LGBTQ youth run risks of being ostracized by classmates or family members when they support LGBTQ rights on personal social media pages. American Muslim youth, especially those involved in social justice campaigns, have had to worry about personal and online surveillance by the government and in their own communities. And #BlackLivesMatter activists have been harmed and arrested at protests that were often organized via Twitter, sometimes for just trying to record events. Instead of comparing what happens on Twitter to what happened during the Civil Rights Movement, the authors say compare Twitter to how civil rights leaders used the telephone to organize. That’s not to say this shift hasn’t come without hiccups. But neither has any shift that has changed politics, and society, for the better.